After winning in the Best Game Design category with Card Thief at the German Developer Awards back in December 2017, we also were nominated at the German Games Award as Best Mobile Game. Max, Oliver and i packed our bags and met up at Munich’s Kesselhaus on the 10th of April to see if we could make up our rather disappointing visit back in 2016, when we were nominated with Card Crawl and couldn’t win. Our expectations were appropriately low since we knew that Card Thief isn’t an easy game and actually demands a lot from it’s players to be appreciated. The Jury in the German Developer Awards is a mix of professionals, hobbyist and people (mostly politicians) who never play games, so winning the award for Card Thief was difficulty from our perspective. Surprisingly enough we still managed to win and were super happy to take home the trophy and the price money which at €40000 is very nice for a team of 3. Overall it was a very nice evening even though the location was quite a down step from the BMW Museum where the 2016 Awards where held. 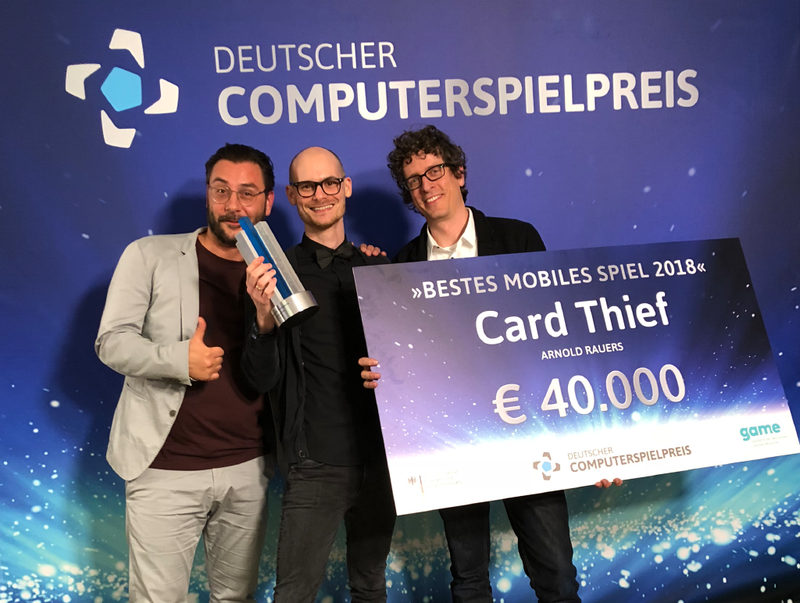 Never the less we are happy about winning the 2nd award for Card Thief and congratulate all nominated and winners of the 2018 German Games Award.